Thursday’s Christchurch GRC’s meeting at the Addington Raceway is a meeting with a real point of difference. Ten of the carded races will feature six dog drawn fields as part of an Australasian trial being viewed towards cleaner and safer racing practices (refer to article in the Advisories section here). The two other events will see the finals for the $30,000 Active Christchurch Electrical NZ St Leger and the $12,000 NZRS Distance finals being contested. The ten six dog fields has been drawn – check them out in the Fields section here. The races involved presents a real big cross section of race distances and classes, with all of the race involved incorporating Super 6 in the respective race names. Bring it On! Another feature staying event rolls around and another wide draw goes Translator’s way. 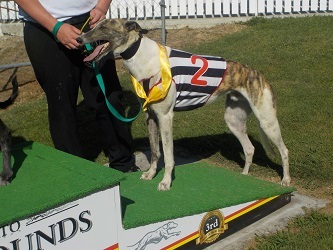 Still this Dave and Jean Fahey prepared railing daughter of Bekim Bale and Delusionist is quite use to overcoming her wide draws as seen by her bold $12,000 NZRS Distance victory from the seven trap at the Cambridge Raceway early last month. She will be sighted wearing the black racing vest again in this 732m event as she seeks her 17th career staying victory, which includes three previous NZRS Distance finals wins. Perfect Result is another proven stayer, prepared by Ray Adcock who bounded home late for his close up 0.6 length third in the same Cambridge final won by Translator. This son of Barcia Bale and Andrea makes his return here after he was also sighted finishing solidly for his last start 3.25 length Ascot Park 630m third behind race rival here Tradition. Splitting the pair was Translator. He will exit from trap four here, with the five trap being vacant owing to this being a seven dog field. The versatile greyhound Dave’s Dot will be sighted wearing the red racing vest for her conditioner John McInerney. This daughter of Cosmic Rumble and Memphis Hotcakes is the only other stayer in this field who holds a C2D grading. She has been competitive from trap one and she owns the ability to contest the pace here as we saw when she delivered her brave pace making Forbury Park 770m win (admittedly back in last July) when she led home Translator. Tradition has only had the one staying race and geez what a huge impression he made for the Fahey’s in it when he stylishly won his staying debut over 630m on Ascot Park in 37.42s. Obviously this son of Dyna Double One and Brichbrook has an exciting future in front of him as a stayer. He will be loaded away in trap two for this assignment. Goldstar Aston is a son of Yella Mustard and Know Love Affair who will hop away from trap eight for his trainers Steve and Bonnie Evans. He has contested three previous Addington 732m races with his best placing being a 9.75 length third behind the smart stayer Ring The Bell. Her only career staying win came 11 months ago over the 645m trip here. That leaves the remaining two contenders who are provided by Gary Cleeve who is seeking to build on the feature race successes he enjoyed at Forbury Park last week. Classy Witch is a another promising stayer who was last presented back in December when she contested the Wanganui hosted version of this NZRS Distance race. She finished a bold 6.5 length second in the 755m final behind, yep you’ve guessed it, Translator. The only other staying races this daughter of Know Class and Know Which has contested was over 645m here for a win (38.53s) and a second placing over the same trip. Know Anxiety, who is a daughter of Yella Mustard and Know Revenge, is a C0D graded stayer who is having her attempt at a staying race here. She actually hasn’t won a race over any distance. Obviously she is picking on some hardened, proven stayers in this event where she will be sighted wearing the white racing vest.